Guest House Maria Francesca is only a few steps from Naples Central Station, we offer comfortable rooms and a friendly and welcoming atmosphere. We guarantee high quality services at a reasonable price. The structure and the rooms are all recently renovated and realized in a late classical style. The free Wifi throughout the hotel. The Guest House Maria Francesca is ideally located for both business and leisure travellers. We have a small Info-point within the property with city map and tourist information. Shuttle service to / from airport, from/to harbour and guided tour can be provided upon request. There is a 24h parking available and car hire is available too. Guest House Maria Francesca has a strategic position and is ideal both for those who are traveling for business, and for those who want to visit Naples and its beautiful surroundings. The accommodation is located in a central area, close to restaurants, pizzerias, bars and fast food. We are only at 50 meters away from the train station center, 100 meters from the Management Center and its shopping area. Also, within 400 meters you will reach the Duomo, the historical center of Naples, and the National Archaeological Museum. The harbor where you can get ferries to the islands of Capri, Ischia and Procida is only at 800 meters away form us. The Metro Station which has two lines allows easy access to all major attractions of the city: Piazza Municipio, Piazza Plebiscito, Via Roma (Toledo), Promenade Caracciolo, Mergellina, Castel Sant 'Elmo in San Martino, Vomero. Also by taking Circumvesuviana trains you can reach in less than an hour Ercolano (excavations - Vesuvius), Pompeii (excavations and Sanctuary), Sorrento, the Amalfi Coast (Bus), Pozzuoli (Circun Flegrea), the Royal Palace of Caserta (regional train). Rooms are all recently renovated, furnished in a late classical style, equipped with private bathroom and with all the comforts. 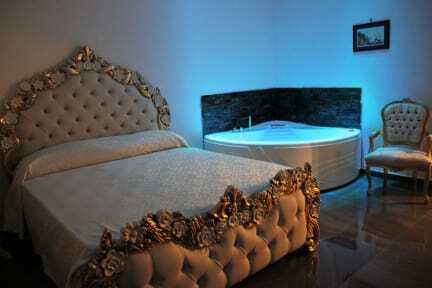 We also have a luxury double room with Jacuzzi. Rooms are located on the first floor with lift. Check in from 10:00 to 22:00. Cancellation policy: 48h before arrival. Payment upon arrival by cash. This property might pre-authorize your credit card. Reception open from 9am to 8pm.